Ideal Pet Products Chubby Kat Cat Door with 4 Way Lock, 7.5" x 10.5" Unbreakab..
Dog Cat Flap Doors with 4 Way Lock for Pets Kitten Entry & Exit-Lockable Safe. These cat doors are ideal for providing access to food and litter, when food and litter is kept out of sight. Easy to use. Manufactured in United States. -Pefect solution to give your cat access to the litter box or food through any interior door, while helping keep the dog or kids out. Trending at $15.24eBay determines this price through a machine learned model of the product's sale prices within the last 90 days. One cat lockable flap door. Easy-to-follow instruction manual: Slide the locks on the bottom of the flap to set the door as following Flap is locked from both sides. Cat can only enter from the outside but not go out again. Soft, smoked vinyl, single flap for energy efficiency. Is this the right item?. We are happy to help! Large: 10" x 15". Design: Dual doors. Big size for both small and big pets. High grade ABS construction, high-end, sturdy and durable. Simple 3-step installation. Main Material: ABS. The Kitty Pass is designed to fit all standard door sizes from 1 1/4" to 1 3/4" thick. Easy install takes about 15-25 minutes. The Kitty Pass is manufactured and assembled right here in the USA. MADE IN USA - PATENT PENDING. One cat lockable flap door. Easy-to-follow instruction manual:Slide the locks on the bottom of the flap to set the door as following Flap is locked from both sides. Cat can go out but can not get back in (for preventing other cats also entering). 🐱 PURRFECT PORTAL FOR CATS - Don't leave your friend hanging! Your furry friend will finally be able to zip in and out of bedroom, bathroom, or house door! Kids love it, friends and family will be amused by it, and your cat will certainly make use of it. Item:Cat Door. 1 x Premium interior cat door. Main Feature Note: Due to the difference between different monitors, the picture may not reflect the actual color of the item. Size is relatively large,suitable for many big cats or dogs pets. 2-way slide lock to open flap or close flap to keep your cat from using the cat door. Pefect solution to give your cat access to the litter box or through any interior door, while helping keep the dog or kids out. One cat lockable flap door. Easy-to-follow instruction manual: Slide the locks on the bottom of the flap to set the door as following Flap is locked from both sides. Cat can go out but can not get back in (for preventing other cats also entering). Product Features PERFECT FOR CATS & SMALL DOGS: Door fits pets up to 15LBS or smaller. Makes coming & going easy-safe EASY TO INSTALL: Pet gate is easy to install on all surfaces including wood, brick, and PVC doors SECURES YOUR PET & PEACE OF MIND: Gives you the freedom of letting your pet come & go as you please Product Details SETTINGS: Entry Only, Exit Only, Two Way, Locked INCLUDES:1x Pet Door;1 x Accessories. SIMPLER ALTERNATIVE: Door Buddy may be simple, but it works! 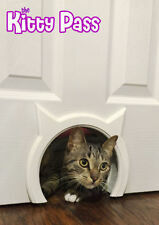 Why cut a permanent hole in your door to install an interior cat door?. Why force your cat to jump into and use a top entry litter box that may make her feel trapped?. The Kitty Pass XL is designed to fit all standard door sizes from 1 1/4" to 1 3/4" thick. Easy install takes about 15-25 minutes. The Kitty Pass XL is manufactured and assembled right here in the USA. 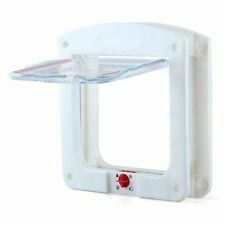 White 4-Way Medium Pet Cat Kitten Small Puppy Dog Lockable Safe Flap Door. · Flap Opening: 8” x 9 1/4”. ·Small children can pass through door. Door Sizing. 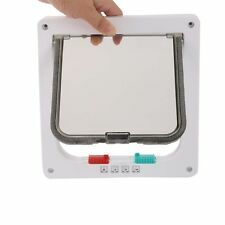 Dogs Cats Flap Door With 4 Way Lockable for Small Medium Pets Entry & Exit White. This item is new in the box. Thanks for looking! Suitable for both cats and dogs so you only need one door for all of your pets. Cat Door: The Small Transcat Cat door is ideal for cats and small dogs up to a Maltese size (around 5kg). 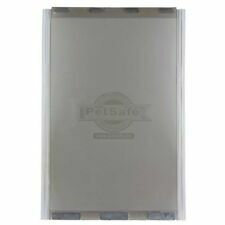 Transparent rigid flap with magnet to stop the flap from opening at will;. This cat door for interior door gives a hole in the door. Safe and Secure -- The cat door embedded in the door allows the cat to enter and exit freely in the room, and there is no accident that the cat's tail is hooked or caught by the door, which effectively protects the cat. 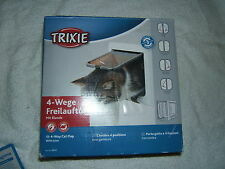 1 x Small Cat Dog Lockable Flap Door. Transparent, solid plastic flap is easy for your pet to open. The locks on the bottom of the flap to set the door as following locking system Magnetic closure design, Closes automatically. 1 x Cat Dog Lockable Flap Door. Easy-to-follow instruction manual: Slide the locks on the bottom of the flap to set the door as following Flap is locked from both sides. Simply push the latch down to lock the door and lift it up to unlock the door. 24W Round LED Ceiling Light Recessed Kitchen Pendant Bedroom Energy Saving Lamp. 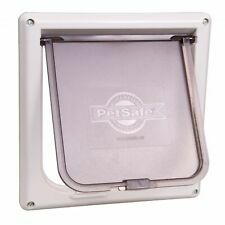 Interior 4-Way Locking Cat Door, White. Attractive Design: The magnetic closure allow your cat to go in and out freely, and brush strip to reduce energy loss and silent action, make your cats more comfortable. 2-way slide lock to open flap or close flap to keep your cat from using the cat door. This cat door is designed to fit interior people doors. For small cats or dogs 15 lbs. or less; flap opening size 5 3/4" W x 5 3/4" H.
Digital Body Fat Weight Scale Electronic LCD Health Fitness Weigh 400LB Bathroom. 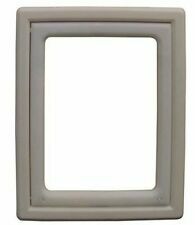 Interior 4-Way Locking Cat Door, White. Attractive Design: The magnetic closure allow your cat to go in and out freely, and brush strip to reduce energy loss and silent action, make your cats more comfortable. This is a new door flap for your little pal. It is supposed to be able to lock, but there is no lock. Still functions perfectly. 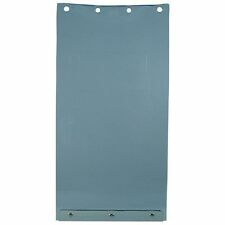 Cat Mate Dog Cat Animal Door Flap. Condition is New. Shipped with USPS Priority Mail.